Mysore Coorg and Wayanad are three of the popular tourist destinations in India. What can be better than visiting all these three places in one single tour? If you are worried about the travel arrangement and accommodation at these places then the best way is to opt for a tour package. We at "Holidays DNA", at www.mysoretourism.travel present a wide range of tour packages combining these three destinations. Our tour packages offer the experience of royal life as well as refreshing beauty of hill stations. With us by your side, you can have stress free travel to all the three destinations. Our "Mysore Coorg Wayanad tour packages" have been designed to cater to all kinds of travel ideas. From honeymoon to family vacation, from budget tour to luxury holiday, we have suitable tour packages for everyone. To make your journey hassle free, our travel experts take care of almost everything related to your journey. Form booking of travel tickets to selecting an accommodation of your choice, arranging guide to booking a cab for sightseeing, we offer our assistance in every possible way. We offer Mysore Coorg Wayanad tour packages from various locations including all the major cities such as Bangalore, Hyderabad, Chennai, Mumbai, etc. We also have tour packages to Wayanad and Coorg from our customers from Mysore. Chembra Peak- Chembra Peak is the highest peak in Wayanad. One of the most popular places in Wayanad, this peak is surrounded with tea plantation. Route to this peak is popular among trekking lovers. A lake on the peak, named Hridayasarasu with the shape of a heart is a major attraction here apart from the breath taking scenic view. Edakkal Caves- Dating back to more than 8000 years, Edakkal caves are located on Ambutkutty Mala. These natural caves are not just a place for sightseeing but the route to them is a popular trekking trail, full of various challenges. It is located at 1,200 meters above the sea level. Meenmutty Waterfalls- Second biggest waterfall of Kerala and the largest waterfall in Wayanad, Meenmutty Waterfall captivate everyone with white streams of water falling from the height of 300 meters. This three tiered waterfalls also offers an amazing trekking opportunity. Muthanga Wildlife Sanctuary- located 16 km from Sultan Bathery, Muthanga Wildlife sanctuary is bestowed with wide variety of flora and rich fauna. A must visit for nature enthusiasts, this sanctuary present the opportunity to get a glimpse of rare wildlife. Facility of elephant rides is also available here. Kuruva Island- Also known as Kuruvadweep, Kuruva Islands is river delta on the River Kabini, located 40 km from Sulthan Bathery. Spread on an area of 950 acres, it is a popular picnic spot offering calm surroundings and breathtaking scenic beauty. Dubare Elephant Camp- It is located on the banks of River Cauvery. At this elephant’s camp, tourists can spend time with elephants. Tourists can bathe, feed as well as take elephants ride in the jungles. Even the facility of camping is provided here. Talakaveri /Talacauvery– It is one of the most popular places in Coorg, attracting devotees and nature lovers alike. It is located in Brahmagiri hill is known for its religious association. Its breathtaking beauty is also worth capturing. Raja's Seat– Raja’s Seat as the name suggest used to be place where royals used to come to admire the scenic view of the valley. The sunset and sunrise view from here is mesmerising. Abbey falls- One of the most beautiful waterfalls in Coorg, abbey falls is located 10km from Madikeri, amid the coffee plantations. The trail to abbey falls also offer good opportunities for trekking. There is also a hanging bridge which adds on to the beauty to place. Madikeri Fort- This majestic fort is living example of Coorg history. It was first constructed in 17th century by Mudduraja. Although this fort saw many changes which were brought by various rulers from time to time. For instance, was renovated by Tipu Sultan and King Linga Rajendra Wodeyar II. Mysore Palace- A visit to Mysore is incomplete without a visit to Mysore Palace. One of the largest palaces in India, this palace is also known as Mysore Maharaja Palace. Built by a British Architect it combines the Indo-saracenic style of architecture with Hindu, Muslim, Rajput, and Gothic architecture. It is official resident of Mysore royal family. Brindavan Gardens- Brindavan gardens are the terrace gardens which were created by Sir Mirza Ismail, the then diwan of Mysore. 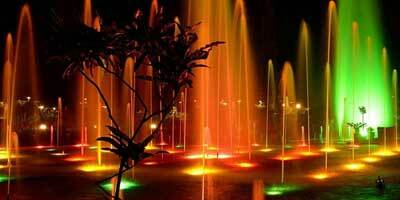 The major attractions here are the illuminated fountains and boating facilities. These gardens present captivating landscapes as well. Jaganmohan Palace/ Jayachamarajendra Art Gallery- Jaganmohan Palace, where the family lived for a brief period of time when old Mysore palace was burnt in a fire accident has been converted into Jayachamarajendra Art Gallery. Along with more than 2000 paintings by various celebrated painters of the world, this art gallery displays many rare collection of coins, currencies, sculptures, ivory and ceramic artefacts, etc. Tibetian Golden Temple- Namdroling Monastery, popular by the name of Golden temple is located in Bylakuppe, which is the second largest home of Tibetans outside Tibet, while the first being Ladakh. This monastery was built in 1963, by His Holiness Pema Norbu Rinpoche. A must visit when on a tour to Mysore. Mysore Zoo- It is one of the oldest zoos in India; also considered to be one of the largest zoos. It is especially known for its wide variety of avian fauna. It is said that birds from more than 40 countries visit this zoo during migratory season. It is must visit for nature lovers.